This IBM® Redbooks® publication is the first of two volumes explaining the approach and implementation of a new hybrid workload integrated in the existing IBM Smarter Banking® showcase, which is hosted at IBM in Montpellier, France. The volumes contain the following information. Volume 1 Assessment describes how to evaluate the requirements of a new IBM Smarter Analytics™ workload. It addresses the user, system resources, and data processing profiles to identify the optimal configuration using IBM methodologies, such as Fit for Purpose (F4P). Because the existing showcase is based on IBM zEnterprise®, the deployment options include IBM z/OS®, Linux on IBM System z®, IBM AIX® running on POWER7® blades within the zEnterprise BladeCenter® Extension (zBX), and Microsoft Windows 2008 Server running on Intel blades also within zBX. 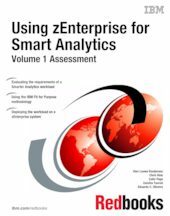 Volume 2 Implementation describes the steps involved in deploying the Smarter Analytics workload in the showcase. With multiple components, including IBM Cognos® 10.1 Business Intelligence, IBM Cognos TM1®, Cognos Metrics Studio, IBM SPSS®, IBM DB2® for z/OS, and many application design tools, the workload spans multiple operating environments. Application clustering, setting up performance policies using Unified Resource Manager, and simulation test execution results are included. This book is intended for an audience of professionals in an infrastructure architecture role. However, architects with a focus on business intelligence and analytics, as well as IT managers, will find value in reading this book. If you want to see this solution in action, contact your IBM representative or send an email directly to mopbcoe@fr.ibm.com.